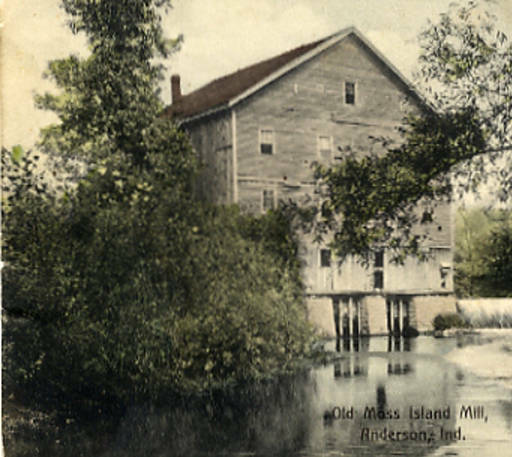 Named for a man-made island in White river, the Moss Island Mill was an institution on Anderson's west side for almost 100 years before it was finally dismantled in 1935. Gone, too, is the island, a victim of dredging in the river years ago to remove obstacles that impeded the flow of water during floods. In its day, the mill served the whole Anderson community in its needs for flour, meal and buckwheat. The first mill on the site was built in 1836 and was located two and one-half mile west of Andersontown. The heart of the mill's two acres of property was located at a curve in the river, with an island made by an artificial canal, or mill race, cutting across the bend and diverting part of the water flow into the race. When the flow of water filled the mill race, an island was created between the two bodies of water. A dam was constructed just above the entrance to the mill race creating an area in the river above the dam called slackwater. In the slackwater area, the river's flow was slowed enough by the dam to cause it to form a pool of water. With the river side of the flow slowed by the dam, the canal side flowed faster. It was the increased water flow that provided enough power to propel the mill's horizontal wheel, known as a "tub mill." When the water struck the blades of the tub, it turned the wheel. Extending from the wheel's hub or center was a shaft that, when connected to other shafts by a series of gears,powered the mill stones which ground the farmer's grain. The mill race, which was also known as Snelson's mill race, was 20 feet wide. Presumably, someone named Snelson was responsible for the race being there, but who that was is unknown. The reason the mill's builder, Joseph Mullenix, selected the site was its close proximity to the planned northern extension of the Central Canal from Indianapolis with its destination being Lake Erie at Toledo, Ohio. Research shows the proposed route of the canal would have passed within a few yards of the mill site. The canal's southern extension was planned to reach Evansville on the Ohio River, thus, providing a convenient outlet for the shipment of the mill's products to all the major markets in the country. Shortly after the mill began, ominous clouds were forming on Indiana's financial horizon. Financial problems caused a halt to construction efforts and the entire canal system became a financial failure.Mullenix did not pay the taxes due on the property, causing it to be sold at a sheriff's sale. The new owners were Lloyd Brown and his partner, Frank Davis, who took possession January 18, 1845. The mill was then called both "Brown's Mill" and "Davis Mill." If it had a name from an earlier time, it has been lost to history. The mill changed hands several times in a short span of years before John and Ann Moss purchased the property. In 1867, the mill was known as the Moss Island Flooring Mills. James Moss, the son of John and Ann, owned the property for many years and even after it was sold out of the family, the name "Moss"continued to be identified with not only the mill but, the surrounding area. The Moss family at onetime owned an estimated 2,200 acres west of Anderson. The east edge of the large tract skirted Raible Avenue on the east and extended a mile or so north and south. John's son, William Moss, bought the mill for $10,000 shortly before his death. In 1873, the mill was consumed by fire, and since there was no insurance, it was a complete loss. Samuel Moss, another of John's sons, built a new three-story mill on the site of the old one. Three sets of millstones were capable of making 75 barrels of flour every 24 hours when it began operating in 1875. It is this mill that was pictured on postcards for many years and was torn down in 1935. The mill's large stone buhrs ground the farmer's corn into meal; his wheat, oats and barley into flour. Many of the millers also operated a saw mill at the site. Research reveals at least 16 owners of the mill during its history. While some of them made money, others lost. The improved machinery in mills in the later part of the 19th century, to a large extent, killed them off as merchant mills plus the fact that they were so far from the railroads put shipping at a disadvantage, leaving small neighborhood grinding as their only source of income. A small community flourished about the site for a time known as "Toadlevel." But gradually the term "Moss Island" came to embrace all the surrounding territory. In later years, the area became a popular swimming, fishing and picnic spot for Andersonians. Early on, there was a ford above the mill race that allowed easy passage across the river. But later another means of crossing the river was found. In the early horse-and-buggy days, travelers desiring to take the road into Anderson had to pay a toll of five cents, at the gate house located next to the gristmill, for the privilege of fording the tailrace back of the dam. The tailrace is the downstream part of the dam where the impounded part of the water re-enters the river. There the water was not so swift and one could drive across to the island and over the dame to the other side of White River, proceeding to Andersontown. An item in the August 18,1930, issue of the Anderson Daily Bulletin stated that, a few weeks earlier, a part of the mill over hanging the mill race had fallen into the water. And finally in 1932, the paper reported that until recently, the mill had continued to grind feed, but at the time, it lay idle in a rather dilapidated condition. The shingles and siding had fallen off, and the framework of hand hewn logs, mortised and tenoned, and held with wooden pegs, was exposed. The iron underwater buckets were turned over to the Boy Scouts and salvaged as scrap during World War II. Today, nothing remains of the mill except some broken stones lying scattered behind the site. However, in the river, a new island is taking shape very near the location of its famous predecessor.